The Washington Post's Jonathan Capehart takes the black Republican congressman to task for inflammatory comments made at a recent campaign event. 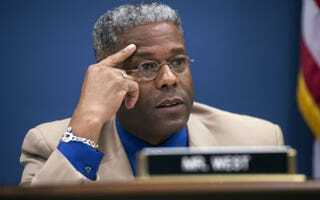 As I wrote in my previous post, Rep. Joe Walsh (R-Ill.) and Rep. Allen West (R-Fla.) are rhetorical bomb throwers. But just when you think they have exhausted their ability to offend they come up with another gasp-worthy comment that lowers the bar of political discourse. Like Walsh, West is a Tea Party freshman up for reelection. Unlike the mouthy Illinois congressman, West faces a primary challenge from a decidedly mild-mannered opponent. So, the shoot-from-the-lip black Republican who last year called himself "a modern-day Harriet Tubman" leading African Americans from what he called the "Democrat Plantation" ramped up the slave imagery at a campaign event on Sunday. The offending comment hits at 1:14 in the video.